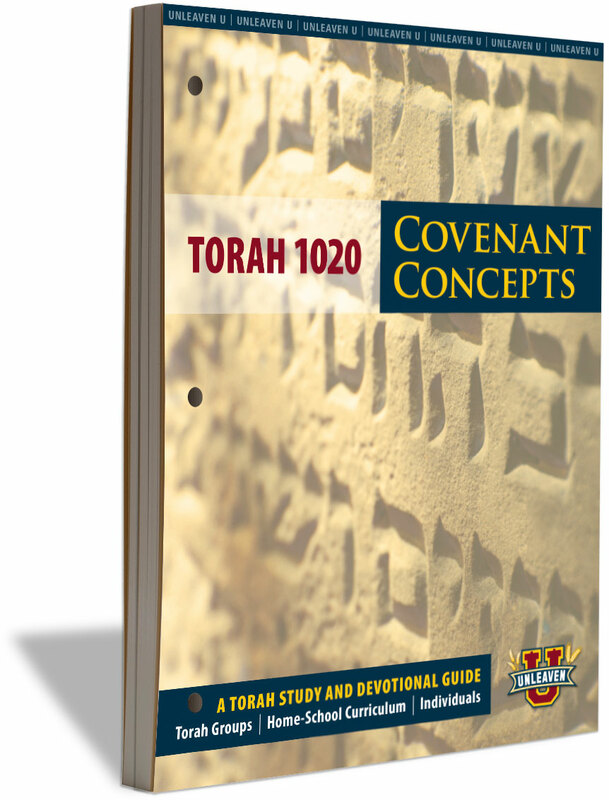 Torah 1020: Covenant Concepts is a full year’s Torah study. 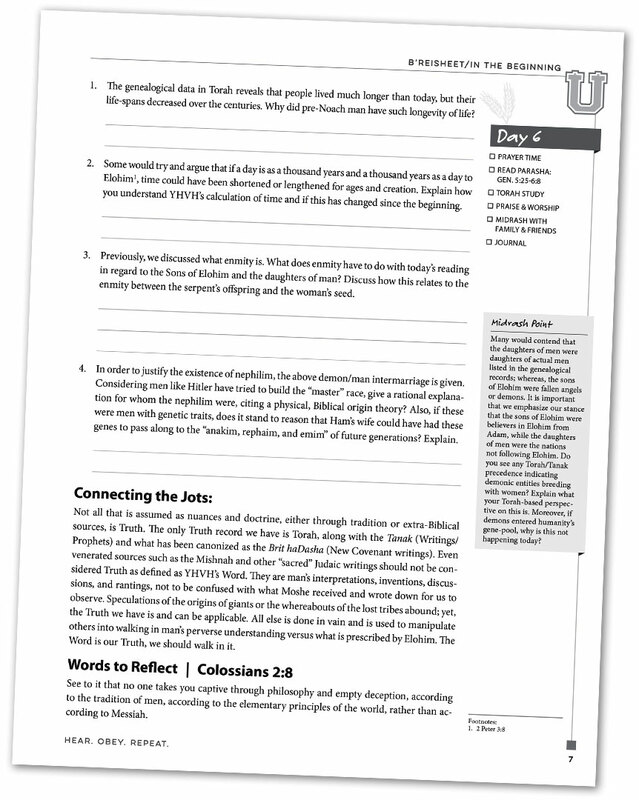 It can be utilized as an individual study guide, and Torah group manual, and an all-in-one homeschool solution. Using daily and weekly Torah portions, Unleaven U integrates Hebraic principles with the teachings of Yeshua, Moshe, Paul, and other Scriptural precepts. With Scripturally-based questions, thought provoking devotionals, and germane discussions, Torah 1020 helps students of Messiah learn while developing a closer relationship with their Redeemer. This relationship is empowered by the Ruach’s teaching each student for personal convictions based on YHVH’s Word that is written their heart. The details outlining each section of the study are below. Click on the images to enlarge and examine the layout of each week’s study in more detail. Each week’s Torah study begins with a discussion-based teaching. These are one-page introductions that give a broad-stroked glimpse of the reading for the coming week. Weekly openers, also, give a conceptual explanation of part of the Torah portion, and connects this to a physical and/or spiritual application. At the top of each introduction page, Torah 1020 identifies the Torah portion name in Hebrew and English. Then, the reader is able to easily find the Torah passage belonging to that parasha, along with accompanying passages from the Tanak and Brit haDasha. This is followed by a reading section, which offers simple to understand basics that are touched on in the weekly reading. 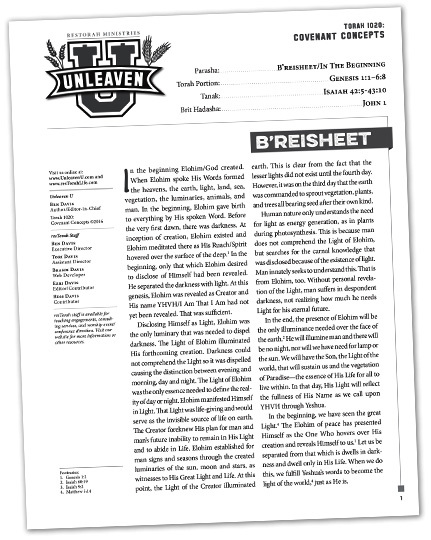 To the left is the copyright details, along with contact information for Unleaven U and Restorah staff. We welcome your feedback and ask that you respect the integrity of our authorship by not making copies of our studies without the expressed permission of our team. At the bottom left is the footnote area. Here, you will find various other Scripture references, which you are encouraged to read in order to further understand the author’s context. Also, this is where you will see the other parasha that accompanies the double-portion if applicable to that week’s reading. Turning the page, Torah 1020 transitions to a daily journal. Each day has four to six questions corresponding to a specified Torah portion. Some questions are straightforward and easily answered, while others take more digging into Scripture and concordances in order to give a more thorough explanation. From easy to more difficult, Torah 1020 questions are designed to make you think and apply both logical and conceptual answers. Logic and reason are used to give straightforward definitions and direct answers. 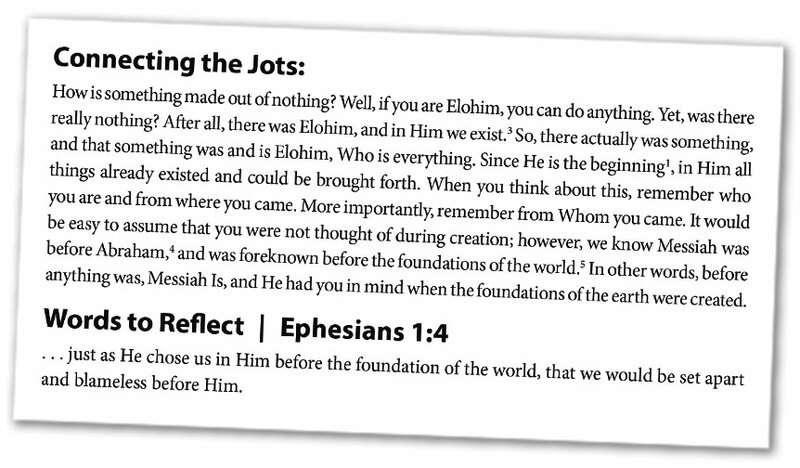 Conceptual answers require you to think in past, present, future, and eternal terms while getting you to think about connections to Yeshua and other parts of Scripture. These are meant to drive home Covenant terms YHVH has made with His creation by looking inside the heart where His Word is to be written. Answers to these will vary based on the level of study and spiritual growth. While some answers could be incorrect, many questions will have varying answers that can be elaborated upon. The amount of effort placed in answering questions will determine what you get out of this portion of the Torah study. In the sidebars, look for callouts called: Sandals or Vocabulary. Sandals are ways in which we can apply Torah through our worship as a lifestyle. Yeshua told us the day is coming when the true worshipper will worship YHVH in Spirit and in Truth. We believe that day is now and these sidebars give insights in walking out Torah in the Ruach and in Emet. The applications are internal and external to the reader’s life, but all of them have shoe leather that is to be put on and applied. The vocabulary sidebars are various words found in a Torah portion that are highlighted, defined, and given contextual meaning for then and now. Look for these so you can expand your Hebrew language skills. One noticeable aspect in the study are the lines provided for answers. Many of the supplied spaces will be more than adequate for answers. Others, though, will need extra space. 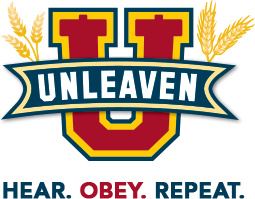 For these, along with other thoughts and notes, Unleaven U has created a system meant to be flexible. By using a three ring binder, students are able to insert pre-designed, loose-leaf pages that seamlessly integrate into the other study pages. 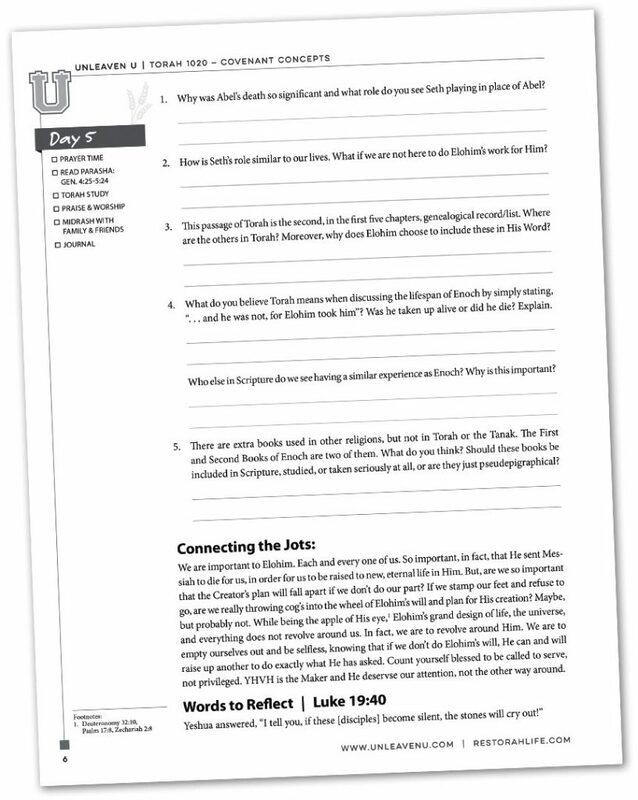 This expands the answer sections, as well as the study, into a daily journal where prayer entries, praise reports, questions to research, and other discoveries can be recorded. 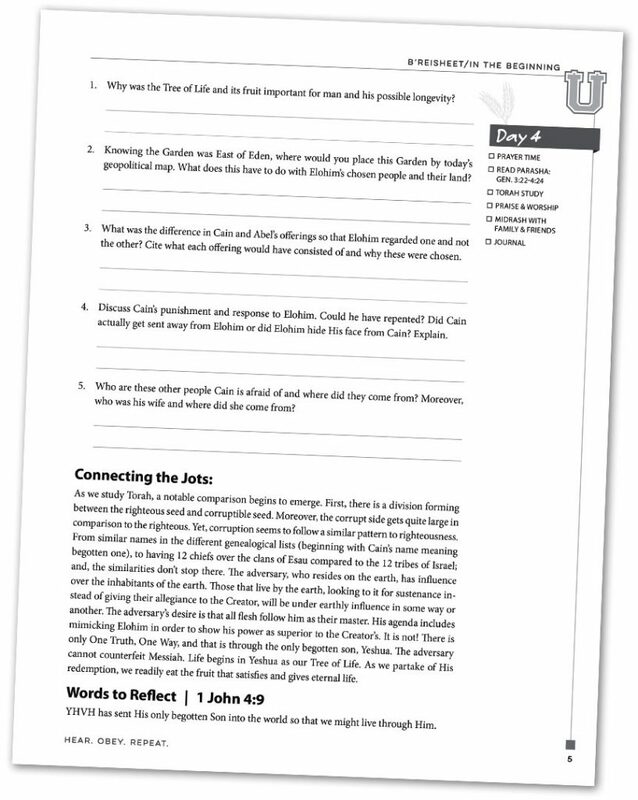 By placing a single, loose-leaf page in between days, extra answer spaces are immediately available for both days surrounding the insert. Or, use a both sides for a single day when necessary. 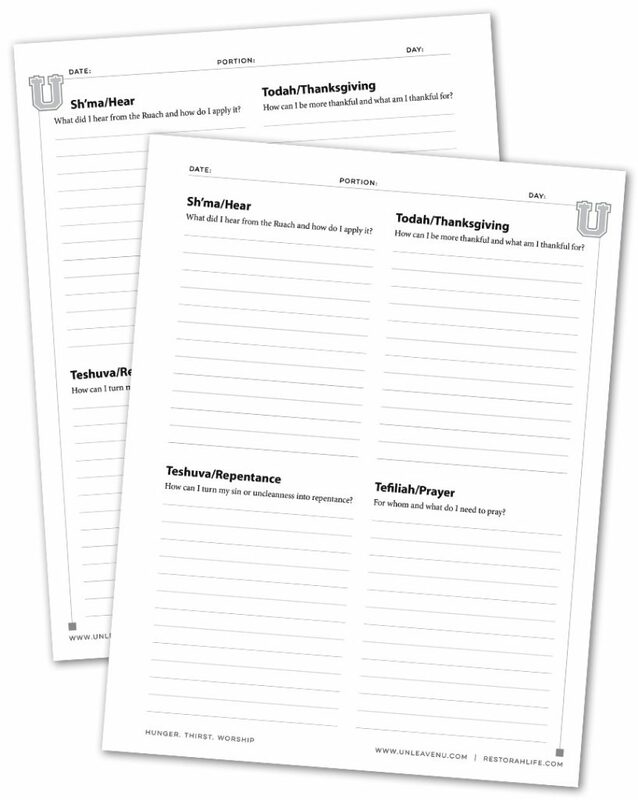 Along with a double-sided answer page, Unleaven U has developed other loose-leaf inserts that allow you to enter journal entries for what you hear the Ruach say, thanksgiving, repentance, and prayer needs. 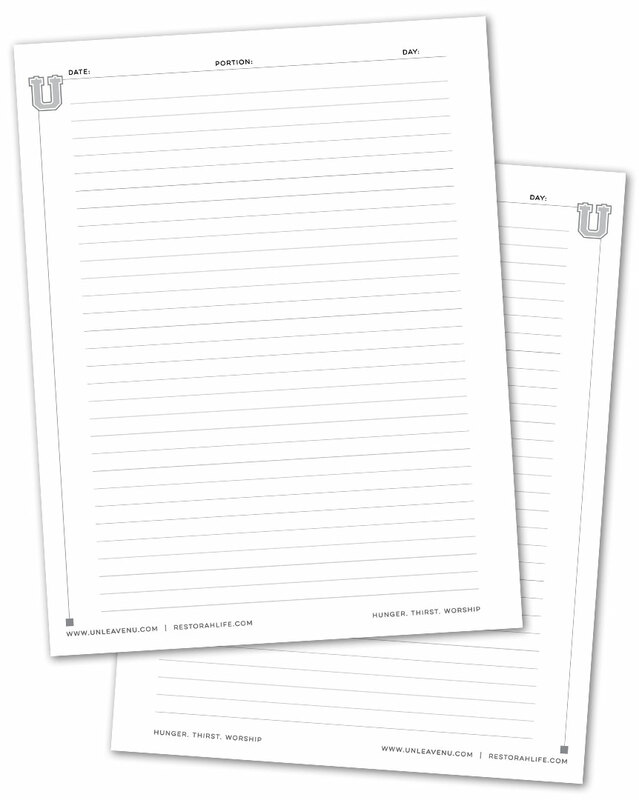 Like the answer pages, these inserts can go directly into your binder, right where you had those thoughts. This will enable you to keep track of when you have breakthroughs and revelations for the strengthening of your relationship with Yeshua. 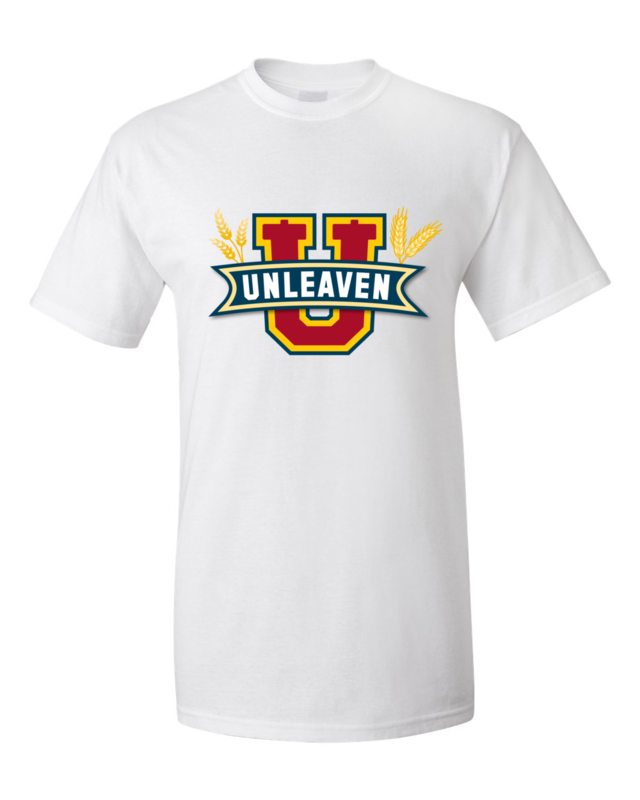 And, here’s a little more about those answers: Unleaven U will be working on providing answer keys for its studies. Since many answers are subjective, discussion-based observations are going to be produced as mp3 and/or video formats. We are excited to start working on these and believe they will be as informative and instructional as the studies themselves. Check our site for any updates, and be sure to subscribe to our mailing list so you can be kept up-to-date. Rounding the corner of each day is a section aptly named Connecting the Jots. 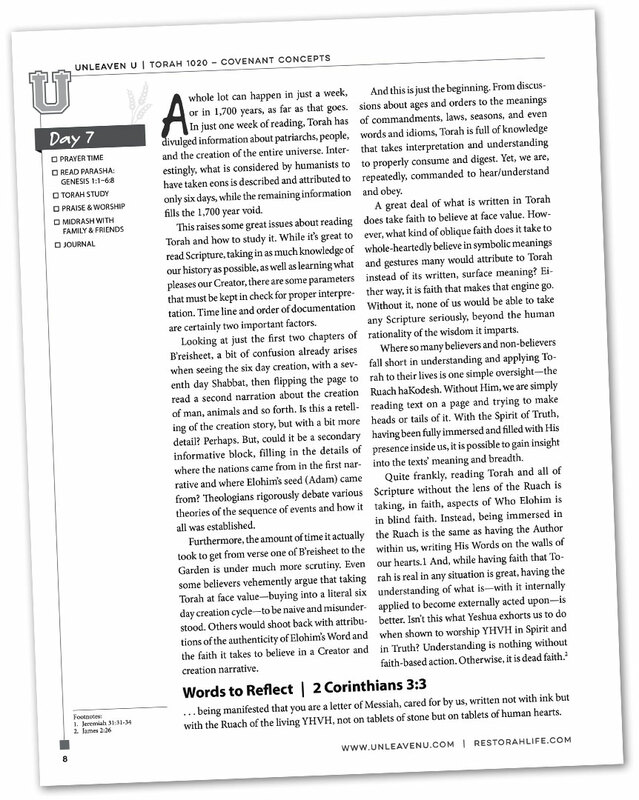 This daily devotional wraps up the questions with insightful concepts and applicable actions. Some of these instructional devotions give covenant concepts that coordinate with the reading, others may relate to a specific question asked that day. Either way, each Connecting the Jots offers readers actionable goals to apply to everyday life calling out real life situations. Like the other parts and pieces of Torah 1020, Unleaven U feels the best way to apply Torah is to have it in our hearts. That’s why Words to Reflect is the perfect way to conclude the daily study. This section calls out a relevant and applicable passage to reflect on internally while reflecting YHVH’s Words back him. As the name indicates, the daily verse ends the day’s study with a way to meditate and reflect on relevant Scripture. Moreover, since man is created to reflect YHVH back to Himself, these verses are meant to give the student a way to show YHVH’s Word to Him in their daily life. This is done outwardly through deeds and internally through inscriptions upon the heart. The weekly study ends on Shabbat. To this point, you may have noticed slight variations between what the regular daily Torah readings would be in a formal, synagogue setting versus Unleaven U’s daily passages. This is done intentionally in order to take a break for school-work and to separate Shabbat from the regular days of the week. Since the only command about reading Torah states to read the book of the Law once every seven years at Sukkot, and the Torah portions were divided as such during the Babylonian Talmudic Era, we felt a slight deviation was permissible so that Shabbat could be appropriately set apart. So, you can study or not on Shabbat, but the ending page is a wrap-up of the week’s readings, questions, and observations in order to give you a break from just answering questions. 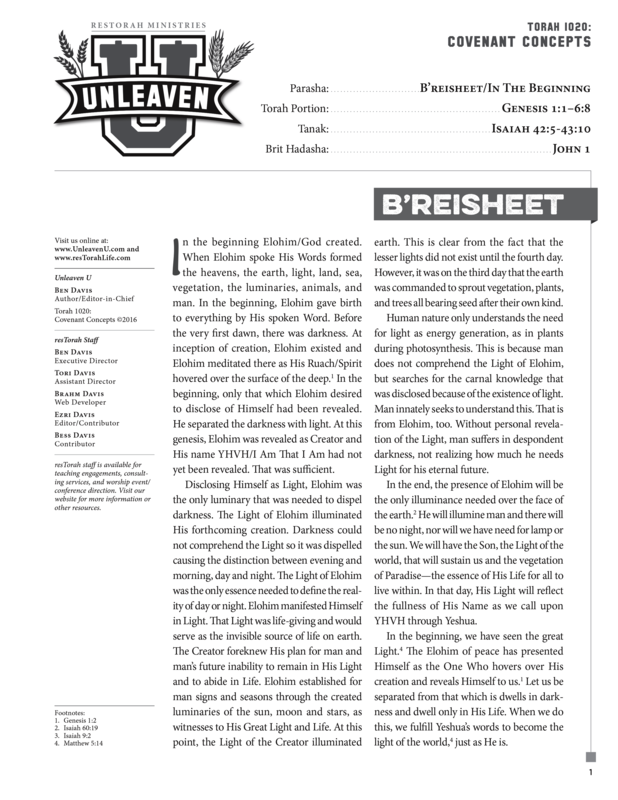 This weekly, last page offers insights and foundational truths that apply to each believer here and now. 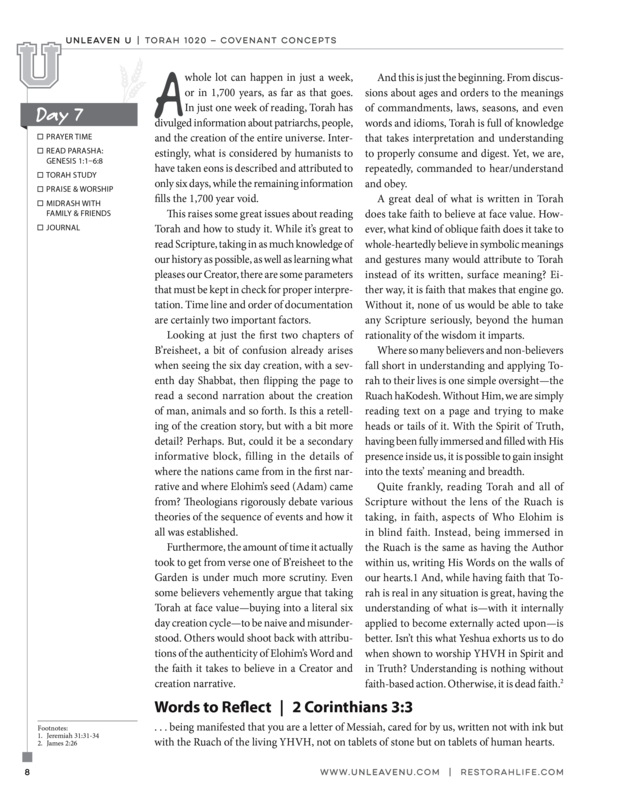 By using discussions from the week’s readings, we have tried to tie specific principles back to Yeshua and couple that with our daily walk and relationships with YHVH and fellow man. It is in this walking out of Torah that YHVH desires to see in us. If we love Him and are called for His purpose, then the final destination is know. It’s the journey getting there that captivates YHVH’s attention; and, it is the journey that we each should be content within here and now moments. We pray the final thoughts each week will be a blessing to each student of Messiah and they encourage each of us to seek His face.